A small group of officers is scanning the truck traffic that floods into the city each day with an aim to ensure the streets stay safe. 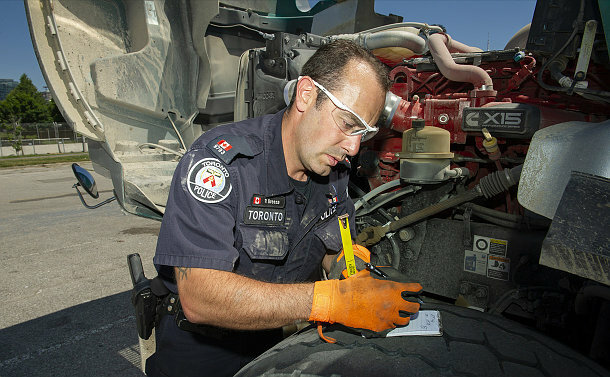 The Commercial Vehicle Safety Inspection section of Traffic Services stop and inspect heavy trucks and other commercial vehicles to ensure they meet all the safety standards – from properly inflated tires to adequate brake systems. Between January 1, 2017 and June 25, 2018, Constable Brian Horton has laid 916 Highway Traffic Act (HTA) charges, the majority of which relate to mechanical defects of a vehicle and/or load security. In the same time period, he also laid 270 charges under the Dangerous Goods Transportation Act. The Service’s HTS unit comprises four core members who can stop and inspect any commercial vehicle on the road. In all, 15 officers are certified Commercial Vehicle Safety Alliance (CVSA) inspectors. The CVSA is an association of state, provincial, and federal officials responsible for the administration and enforcement of motor carrier safety laws in Canada, the United States and Mexico. It was established to promote an environment free of commercial vehicle accidents and incidents. Brown reminded drivers to do their pre-trip inspection check, which is a regulated requirement, before getting behind the wheel. So far in 2018, the HTS and other Traffic Services CVSA inspectors have done nearly 773 vehicle inspections. 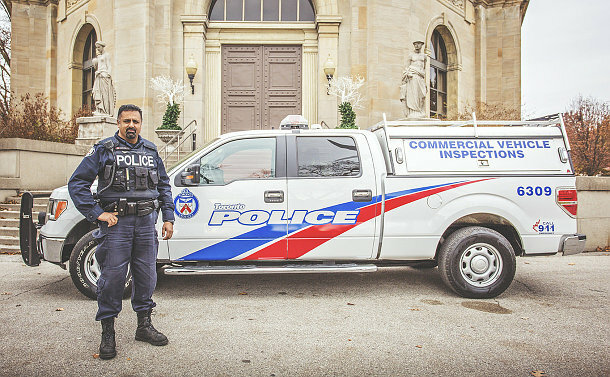 “With the amount of developing infrastructure in and around the city at present, the volume of commercial vehicles on the streets has exploded exponentially, making the Highway Truck Squad a critical and valuable asset to the Service,” said CVSA inspector Constable Paul Breeze. Constable Dal Gill recalls a call he received to investigate a school bus on the Don Valley Parkway with a loose wheel. Gill said the CVSA program is a very useful asset. “It is a great way to build relationships with a number of police departments and other investigative services across North America,” he said.